Rowan's pale brown wood is hard and is a delight to wood turners who can create beautiful useful bowls, plates and containers using Rowan wood. It's wood is also wonderful for turning table and chair legs. Rowan wood is also lovely for making bird tables with. Rowan wood is good for small projects like sills and add ons to buildings, but it can be hard to find logs thick enough to prepare wood for those jobs. Ancient warriors, those under command of the chieftain, were usually archers using bows made from Yew wood. As Yew is slow growing and availability of its wood limited, other people made their bows from Rowan. These 'commoner' bows were mainly used for hunting and not often used to supplement the Yew bow carrying warriors in battle. Another important ancient use of Rowan was the making of what we call 'harps' today. 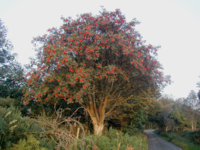 When they were made from what we call Rowan today the Rowan name comes from a word expressed in various spellings including Coarran. There are jokes that have been around a long time that ask what came first, the archery bow Rowan or harp Rowan, as they are both strung bows. These jokes are made interesting through ancient stories that tell of warriors failing to win battles or make their kill with their archery bows and arrows, and then along comes the Bards with his bowed harp and puts the entire enemy army, or hunted animal, to sleep though plaing a Bardic Strain Of Sleep. The Coarran harps was said to be an angular harp something between the Chang harps of Iran and Cruit high headed harps of Ireland, which are different to the Clarsach style. Their frames are said to have been made from Rowan, then craftsmen discovered that these harps amplified well when sound boxes made from willow were attached. Harp makers also developed a fondness for making tuning pegs from oak. There are even legends of an actual harper called Coarran who understood and taught the three Strains of the Bard, these being Joy, Sorrow and, and mentioned above Sleep. The Sleep strain is also known as the Dreaming through which the Aisling rises. The Morrigu, Morrigan, was said to be the woman of the Rowan who passed bravery, courage, passion and protection to men through the Rowan. This is why Bards with Rowan harps, Coaranns, were called upon to play and perform before men to recite what the Goddess was speaking to them through their harp. Through the Bard it is said the goddess could serve them their courage, passion and the focus of the warrior. The Morrigu, as you will have read in the interpretation of the story poem, being the woman of the Rowan, also lured men to sleep through a Strain of Sleep either to pass them through to the Otherworld, or to awake again as a new man full of energy, passion, bravery and focus again. I interpret this as learning to craft the Rowan wood with confidence and authority to create beautiful things that anyone approaches will be enchanted by. A crafting person working with Rowan should never have expectation of appreciation but with sustained confidence and belief in the work the appreciation and acceptance is bound to be abundant.